The figures cover both 15 & 25 mm singles competitions. They don’t include 24 player registrations for the newly released FOG Renaissance rules. The figures for Roll Call are mainly based on registrations; all the others are based on actual games played. If you read an earlier version of this post you’ll notice that the table above now has 8 DBM registrations in 2010 rather than none. It turns out that Roll Call included a small DBM competition this year. It was omitted because nothing was listed along with the registration information for all the other competitions. Once I’d been made aware I managed to find the DBM results, and therefore the number of players, via the South West DBM Doubles League pages. It doesn’t change things much. Competition registrations were down 3.4% in 2009 vs. 2008. 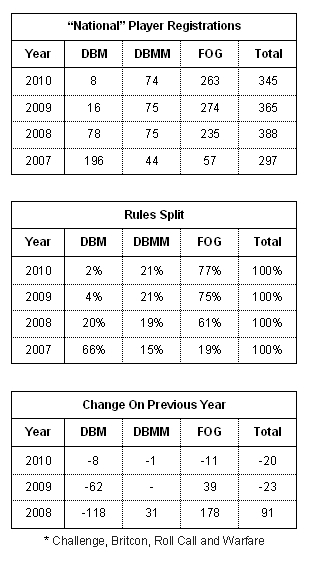 FOG continues to grow whilst DBMM registrations were static. DBM’s decline is nearly complete; the 8 players were all at Britcon. FOG has reached a dominant position. DBMM has retained its niche position. Competition registrations were down 5.5% in 2010 vs. 2009. FOG Ancient & Medieval registrations fell for the first time. DBM’s continues its slow, lingering decline. FOG has improved its dominant position (up 2% to 77%). DBMM is both stable and static despite the absence of DBM. The absence of a viable DBM national competition scene; not all former DBM players will have switched to DBMM or FOG. The introduction of FOGR to the competition scene enticing some FOG players to switch periods. On balance if this year’s figures show a similar decline then I think the trend will have been confirmed. The overall pool of League players has remained steady since 2008. FOG had 79% of the 2010 player registrations, up from 54% in 2009. DBMM 2010 player numbers declined but then 2009 looks exceptional. There’s no longer any demand for DBM in the north of England. Overall, this is a very similar situation to the national picture with the exception that FOGR is not tempting players in the Northern League where player numbers are more stable as a result. I would read the current situation as: The introduction of FoG and to a lesser degree DBMM kindled an interest in ancients war gaming. FoG has captured the majority of players, both new and ex-DBM, at around 80% with DBMM at 20%. This split has not changed substantially for the last 3 years and suggests both rule sets have healthy if different audiences. While overall registrations have dropped steadily, they are still higher than when DBM was the only option. Basically I see a DBMers switching over to the new rules sets with a flurry of new players getting into both sets. FoG gets the lions share with DBMM in a smaller but solid position. While some players are leaving we are still in the black so its positive news for both camps and the hobby overall. Thanks for the comment Pat. Thoughtful as ever. I agree with the comment about 5% (in any one year) but the 2008-10 trend is down 11% which is a larger variation. Having said that I suspect that the majority of the 24 2010 FOGR players came from the FOG pool of players. I can't prove it but this probably explains the 2010 "dip". For 2011 it depends on whether FOGR continues to grow in popularity at the expense of FOG. Time will tell.